Tabriz silk look rugs offer all elegance and style of a handmade silk rug but without the price tag! This range is made from 100% viscose, this type of yarn enables the rug to emit a warm light reflecting appearance just like the real handmade original. The pile height is 6.25mm and is densely woven, the pile weight is 1790g/m2, all rugs have a short fringe at each end. This range has a slip resistant reverse coating making it ideal for wood floors. 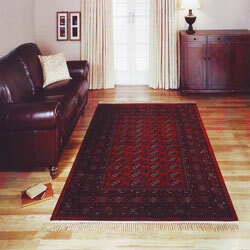 Tabriz rugs are made in 3 sizes including a runner, the pile has a stain resistant coating.